Cast: Michael Caine (Harry Palmer), Jason Connery (Nick), Michelle Rene Thomas (Brandy), Michael Gambon (Alex), Michael Sarrazin (Craig), Tanya Jackson (Tatiana), Serge Houde (Dr Vestry), Anatoly Davidov (Yuri), Vlasta Vrana (Hans Schreiber), John Dunn-Hill (Louis), Lev Prygunov (Colonel Gradsky). Crew: Doug Jackson (director), Edward Simons, Kent Walwin, Alexander Goloutva, John Dunning and André Link (producers), Peter Welbeck (writer), Rick Wakeman (music), Peter Benison (cinematography), Vidal Beique (editor), Chris Tulloch (production designer). Synopsis: Former British secret agent Harry Palmer runs a private investigation agency in Moscow, aided by Nick and several more former employees of Alex, a deadly crime boss in St Petersburg. Nick is dating a ballerina, Tatiana, whose father Feodor is a curator at the Hermitage art gallery in St Petersburg. Harry is hired to recover a kilogram of enriched plutonium, enough to make three atomic bombs. Alex tries to kill Palmer with a letter bomb. Harry and Nick travel to St Petersburg, seeking the missing plutonium. Tatiana is abducted. Alex threatens to kill her unless Feodor helps him. Harry asks for help from Yuri, a St Petersburg gangster and rival of Alex. In 1994 Caine went to Russia for filming of a new Harry Palmer movie, Bullet to Beijing (1996). That picture finished shooting in October and director George Mihalka departed, but Caine agreed to stay on for an extra month to make another Harry Palmer movie. 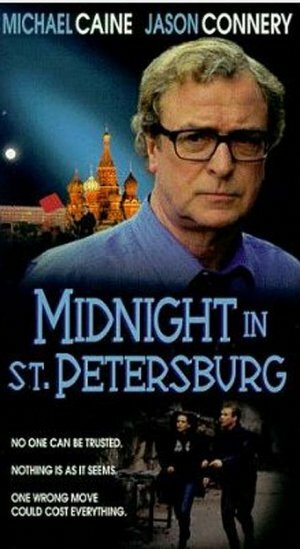 Midnight in St Petersburg was never intended for cinemas, instead being made to premiere on the Showtime cable network in America. ‘I said okay, since the entire company, same people, same places were utilised,’ Caine told Variety. ‘But my main interest is in the feature.’ There was talk of further Harry Palmer made-for-TV movies if Midnight in St Petersburg proved successful, but Caine was not interested in such projects. Midnight in St Petersburg made its American debut on a cable TV soon in 1997, rated R by the MPAA. In Britain the TV movie went straight to video in April 1997, rated 15, but has since been deleted. The film is available on DVD – in Spain. Verdict: Most of the criticisms of Bullet to Beijing apply twice as strongly to this execrable effort, bankrupt in imagination and effort. Caine looks like a man haunted by how low his career prospects have sunk. This direct to video dog is arguably the nadir of his film career in the 1990s, although On Deadly Ground (1994) and Shadow Run (1998) also lay claim to that dishonour. They have the advantage of being so bad that some ironic pleasure can be derived from seeing them. Midnight in St Petersburg is just wooden, lifeless and dull.